On or about this day in 1813, Laura Secord set out from her home in Queenston, Upper Canada, on a 12-mile journey through the bush that would eventually make her a legend and perhaps the best-known Canadian figure in the War of 1812. Her exploits are associated with the Battle of Beaverdams on June24, 1813 -- one of the most decisive victories of First Nations people over an American army. More than 600 U.S. soldiers, along with two field guns and two wagons, surrendered to a group of 400 warriors, and a handful of redcoats, led by a French Canadian captain and one smooth-talking Irish lieutenant. But even on this, a day when Canada celebrates the cultures and achievements of Aboriginal peoples on National Indigenous Peoples Day, most Canadians don't remember the Battle of Beaverdams as a decisive First Nations victory. 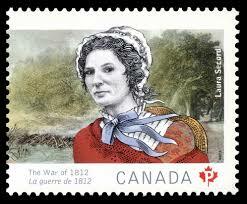 Those who know the history of the war think of 38-year-old Laura Secord, mother of five children. She had been tending to her wounded husband when their home was occupied by American officers. Laura heard them speak about a pending surprise attack against DeCew's house, headquarters of Lieutenant James FitzGibbon and his "Bloody Boys" in their raids against the Americans. Laura set out alone on a perilous journey to warn FitzGibbon, who sprung a trap and captured the invaders at Beaverdams. That's the story. Did Laura Secord change the course of the war through her bravery? Likely not: the 300 Mohawk warriors from from Caughnawaga (Kahnawake, near Montreal) and another 100 from Grand River (Brantford) were probably well aware of American movements. Commanding his special forces (the "Bloody Boy" or "Green Tigers"), Lieutenant James FitzGibbon likely regarded Secord's report as confirmation of what he already knew. 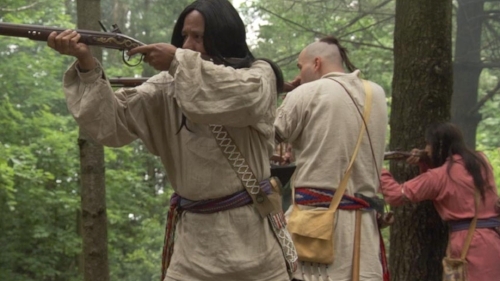 After the battle, Mohawk war chief John Norton observed, ""The Caughnawaga got the victory, the Mohawks got the plunder and FitzGibbon got the credit." Following the battle, there was no mention of any contribution by a resourceful woman. And with good reason! If I was Laura Secord, and needed to return to Queenston and my wounded husband and five children, the last thing I would want would be rumours spreading that I had been spying for the British. Laura Secord's exploits were unrecorded until 1831 when she asked FitzGibbon to write on her behalf in an unsuccessful bid to be given the job of tending to the newly-erected Brock Monument. When her husband died in 1841, Laura was left destitute, and she continued to petition the government for a pension that would acknowledge her wartime service. It wasn't until 1860, when the Prince of Wales visited Canada and he heard of her story, that he gave her a hundred pounds sterling as an award for her service. That was to be the only compensation for her heroism she received in her lifetime. She died in 1868 at the age of 93 and was buried beside her husband in the cemetery on Drummond Hill, where the Battle of Lundy's Lane had been fought in 1814. By the time of her death, however, a new generation of Canadians was coming age that would soon shine the spotlight on her as a new heroine for a new nation. With the publication in 1886 of his epic verse play, Tecumseh, Charles Mair launched an intellectual movement in Canada that saw the War of 1812 as the young nation's foundation myth. Against overwhelming odds, stalwart Canadians and their First Nations allies had defended their homes against a rapacious invader, forging indelible links to the British Crown. Through their courage and determination during the War of 1812, Mair said, Canadians defined a distinctive and morally superior new nation in the northern half of North America. The message resonated in its day, and other writers, poets and painters took up the theme. In 1887, the journalist, poet and women's rights activist, Sarah Anne Curzon, published her play Laura Secord; the heroine of 1812, "to rescue from oblivion," she said, "the name of a brave woman, and set it in its proper place among the heroes of Canadian history." In retrospect, Curzon succeeded beyond her wildest dreams. By the turn of the 20th century, Canadian magazines and school books highlighted the Laura Secord legend. Monuments and statues have been erected to her at Queenston Heights, at Lundy's Lane, and at the National War Memorial in Ottawa where she is included among the military heroes honoured as "The Valiants." In 1913 (on the centennial of Beaverdams) a confectioner opened a store on Yonge Street in Toronto and named it after Laura Secord. Today, Laura Secord Chocolates has 120 stores across Canada and is the the countries best-known chocolatier. The Laura Secord house in Queenston, owned and operated by the chocolate company, remains a tourist attraction. The tour guides are very knowledgeable and the place is well worth a visit for visitors to Niagara Falls and Niagara-on-the-Lake. When the Museum of Civilization (now the Canadian Museum of History) conducted a survey of its visitors to the bicentennial exhibit in 2012, Laura Secord emerged as the best-known figure in the war -- ahead of Isaac Brock and Tecumseh. In writing Blood Oath, I used the Laura Secord legend and combined it with what historians like Carl Benn and James Elliott have uncovered on what really happened those long summer days in June, 1813. Eli scouts for Colonel Boestler and the American army. Meanwhile, Jake learns of the American plans for a surprise attack and leaves Newark in the early morning to warn the British. As he scrambles up the Niagara escarpment, he encounters someone else who is bushwhacking through the tough terrain to sound the alarm: Laura Secord. For the storyteller, the meeting between Secord and FitzGibbon can serve as a backdrop to another narrative that is totally fictional. Storytellers do that with history. But nations do it too. We reshape the stories to suit our desired narratives. In the 1880s, both the young nation of Canada and the first stirrings of the women's movement required a heroine and Laura Secord became the focal point of the story of Beaverdams -- and the War of 1812. In 2018, First Nations are reasserting their place in how we explain our history, so Laura Secord may eventually become less central to the battle than the determination and resourcefulness of the warriors who inflicted such a decisive defeat on the Americans. Sometimes we take great liberties with the actual facts -- even the actual locations. The Battle of Beaverdams was fought on a remote site in 1813 and it remains a remote site today. To get to it, you cross through the tunnel below the Welland Canal. A stone boulder has been erected honouring the First Nations who fought the battle -- emphasizing the Kahnewake Mohawk. But a few miles away, the original monument has been moved to a park in the heart of Thorold -- where more people will see it and, hopefully take time to reflect. We do that with our history: find ways to shape it and reframe it so it makes more sense to us and our world. And if there's a park in the middle of a city, far from the battlefield, that makes us reflect on the battle, then I'm all for it.